The rubber tree is an ecologically sustainable crop. — Flipping the Footwear Market. There are many different kinds of rubber, but they fall into two broad types: natural rubber (latex—grown from plants) and synthetic rubber (made artificially in a chemical plant or laboratory). We are using Natural Rubber. Tree-derived rubber is friendly to the environment as it is made from an entirely natural product. The rubber tree is an ecologically sustainable crop and actually contributes to the maintenance of the global carbon balance in the atmosphere. The secretion of the latex is a part of the tree’s natural healing process. The latex is then strained, diluted with water, treated with acid, rolled into sheets, and then air dried to make it ready for use. The use of this renewable resource is a great way of producing environmentally friendly rubber. We told you we were serious about feet. As its name suggests, the rubber tree Hevea brasiliensis originally came from Brazil, from where it was introduced to such countries of the Far East like Malaysia, Indonesia, Burma, Cambodia, China, and Vietnam. Latex found in nature is a white milky fluid found in 10% of all flowering plants and is a complex emulsion that coagulates on exposure to air. It is usually exuded after tissue injury. The word latex is also used to refer to natural latex rubber, particularly non-vulcanized rubber. 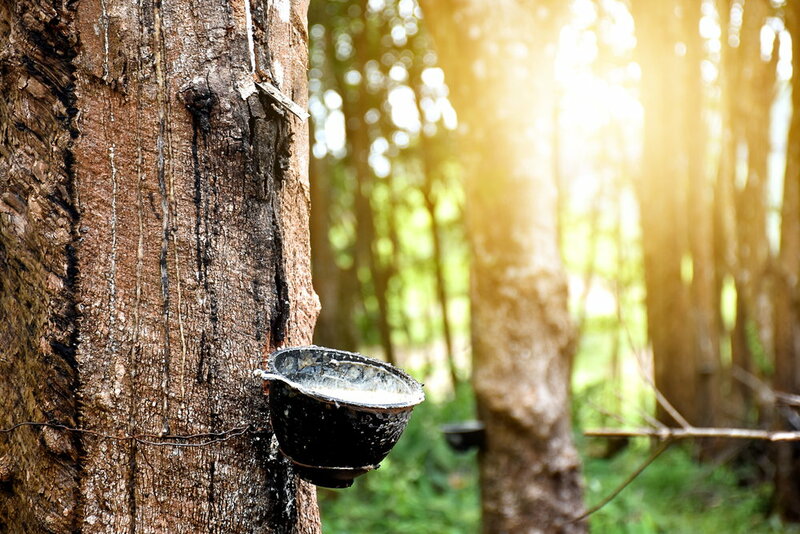 Rubber trees begin to yield natural latex approximately 6 years after planting and continue to produce latex for a further 26 years. Generally, a tree will yield approximately 4-5 Kgs of latex per annum. There are a number of factors that directly affect the yields of the tree, the quality of the tapping (including the accuracy of tapping angles), the age of the tree, the use of rain guards and actual rain fall pattern. 1. Tapping: the process of extracting latex by the controlled shaving at a specific angle of the bark of either half or one third of the circumference of the tree. 3. Factory processing: the process by which latex is processed into dried rubber bales or pellets. Natural rubber has a high tensile strength and is resistant to fatigue from wear such as chipping, cutting or tearing. On the other hand, natural rubber has only moderate resistance to damage from exposure to heat, light and the ozone in the air. Natural rubber also has tack, which means it can adhere to itself as well as other materials.